For those of you have and use forklifts, you know the benefits. They are a wonderful invention that saves time, money and a lot of back problems. Unfortunately, forklift manufacturers have only been giving consumers part of the truth. And that my friend can end up damaging property or worse yet, kill you or your employees. People are shocked when I tell them that their forklift cannot lift what it says it can lift. It’s a lot like the your neighbor telling you his bench press max or about the fish he caught last week – he stretches the truth quite a bit. Every forklift comes with a data id plate. On that plate it tells you the maximum capacity the forklift can move. Typically in the 4,000 to 5,ooo pound range. And yes it can lift that capacity but only if all additional conditions are met at the same time. What conditions are those you ask? Cargo Load Center. Cargo Load Center is the center of the load that you are carrying. The forklift data id plate has a listed Load Center on it. This is typically 24 inches. The forklift can carry the maximum capacity at the listed Load Center. But once the Cargo’s Load Center moves beyond 24 inches, the maximum capacity start to diminish drastically. It starts to drop approximately 200 lbs for every inch past Load Center the cargo moves. A 5,000 max capacity drops to approximately 4,000 at a 30 inch Load Center. And that presents two issues. How often do you carry cargo with a perfectly matched 24 inch center? The answer is rarely. When I observe forklift operators, rarely do they understand this concept (something trainers need to address better). Worse yet, many do not pick up the pallet with it fully touching the mast (moving the Load Center out) which reduces the max capacity. In addition, many times cargo is simply larger than what fits on a pallet throwing off the Load Center. This means you need to measure. Forklift operators should really understand the load that they are moving. They need to know the overall length, the Load Center and the weight. Then they need to understand how to calculate the new maximum capacity of their forklift. 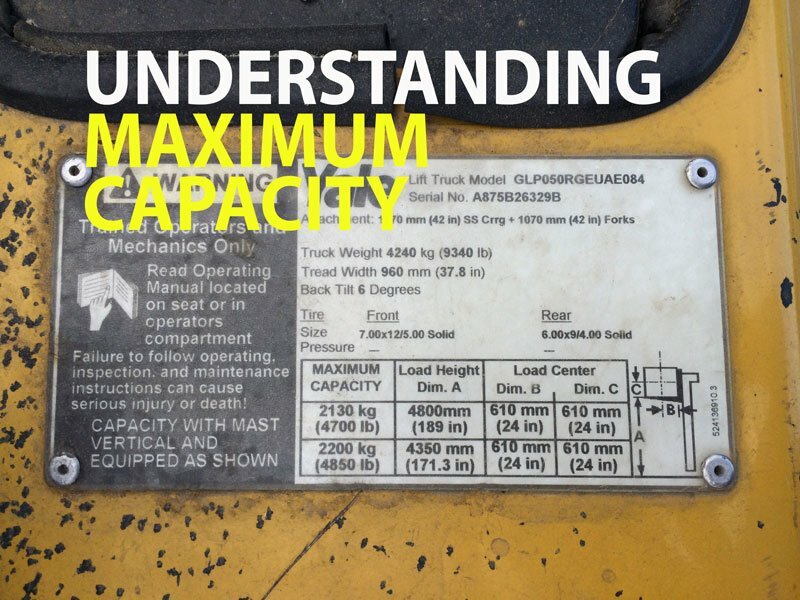 I built a calculator to determine new maximum capacity to help forklift operators in the field. As discussed above, this unspoken fact (maximum capacity drops) is a serious issue that the data id plate does not address and not understanding it can kill you and damage property. Previous Jeep crushes canoe. Was it distracted driving? Next Anyone can report serious injuries to OSHA. As long as they are authorized.